At the beginning of 1944, the 185th Nembo Autonomous Parachute Unit was employed on the Gustav line front exchanging heavy fighting against seasoned German Units. Some of the heavier engagements were Mainarde, Monte Marrone and Monte San Michele. The Germans gradually withdrew from the front, moving first on the Frieda Line and then the Mathild Line at Filottrano, in the Marches. On March 23, 1944, partisans in Rome attack an SS police detachment, killing 32 Germans. Consequently, an infuriated Hitler ordered 10 Romans dead for every German killed. So 335 Jews, captured partisans and other citizens were killed. This action only caused the partisans to grow more organized. Six major parties formed to fight the Germans and the Salo Republic: Communists, Socialists, Labor Democrats, Christian Democrats, Liberals and the Action Party. Since Italy was not able to offer any kind of elections, Badoglio’s new government gave each party an equal voice. By May of 1944, a retrained and reequipped Italian army consisting of 100,000 men joined the Allies in the fight against Germany. On 4 June 1944, the Allies, along with 5,000 Italian troops, were able to take Rome. The partisans fired Badoglio’s government and forced King Emanuele out of the throne. As a result, the new Prime Minister-elect was Ivanoe Bonomi and the crown went to King Emanuele’s son. 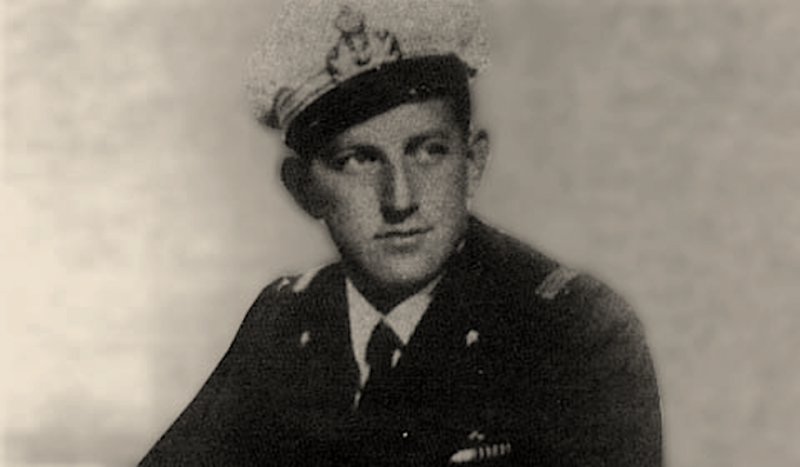 Luigi Durand de la Penne and British frogmen conducted an attack at La Spezia in 1944. On 22 June 1944, the Italian destroyer Greciale carried British Frogmen, along with Italy’s Commander Luigi Durand de la Penne (the Italian frogman who severely disabled the HMS Valiant) to La Spezia, where the Germans manned the naval installation. They entered the harbor and sank the unserviceable cruisers Gorizia and Bolzano. The Germans had planned to use these ships as blockades of the harbor entrance. On 7 July 1944, a Nembo attack was concentrated with the 183rd and 184th Guastatori Battalion. As a result, Filonttrano was liberated with heavy losses (300 Italian paratroopers killed or wounded). Soldiers of the Italian Co-Belligerent Army. The Allied Italian Air Force achieved mixed results. In some instances, they would not intercept RSI aircraft during Allied bombing sorties. The main reason was that the RSI Air Force was attempting to prevent the bombing of Italian cities and, although unspoken, most Allied Italian fighter pilots wanted these cities protected as well. 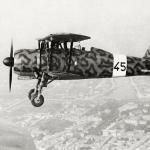 At the beginning of 1945, the Folgore Combat Group deployed to the front between Senio and Santerno valleys. However, the Germans prepared a strong defense to bar the entrance and employed their Fallschirmjager of General Ramcke. 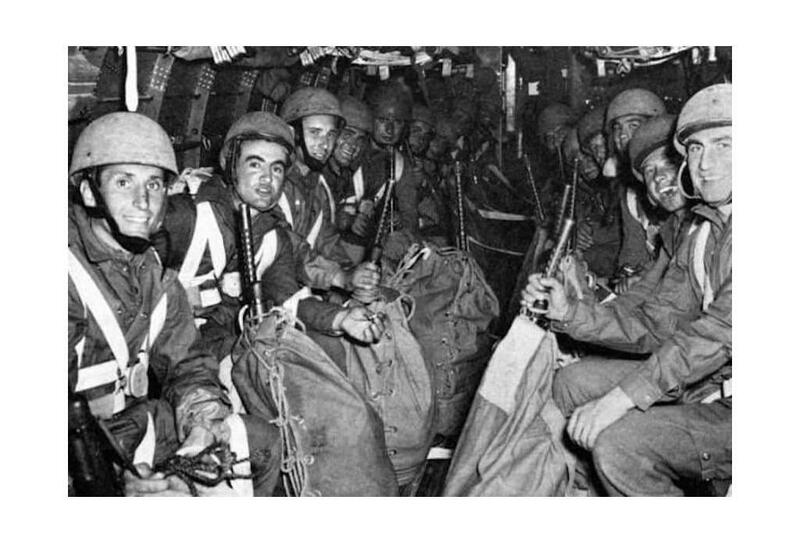 Italian paratroopers take part in Operation Herring in April 1945. This battle occurred at Grizzano on 19 April 1945. After a day of heavy fighting, Germans are forced the leave their positions and withdrew. The day after, 255 Italian paratroopers of F Squadron and Nembo Regiment flew on an American Douglas C-47 to take part in Operation Herring to bring confusion to the German rear area. They were very successful in assaults, sabotages, destruction of vehicles, depots and military installations. Partisan actions in the north were more radical than any other place in Italy. The highly organized Communists formed Garibaldi Units. These units, which included special teams such as the Gruppo d’Azione Popolare (gappisti) carried out direct attacks against Germans and Fascists. For example, one of their favorite tactics was to wire explosives on a road used by Axis trucks. The Communists also formed anti-scorch squads preventing Germans from sabotaging power plants, factories, bridges, and dams. Guerrilla bands raided depots for weapons and used air dropped Allied ammunition to blow up trains, mine roads and ambush German and Republica Sociale Italiana (RSI) troops. In other areas, partisans split up into bands and adopted hit and run tactics, blocking mountain passes and ambushing patrols. 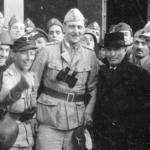 Underground leaders commenced full-scale insurrections in Bologna, Turin, Venice, Genoa, and Milano, expelling the Germans hours and even days before Allies were able to arrive. In Turin, citizens drove a truck into a prison and liberated many political and other prisoners. Additionally, communists barricaded themselves in factories, throwing Molotov cocktails at passing German convoys. Moreover, anti-scorch squads prevented Germans from sabotaging their factories. In Florence, street fighting lasted a week until the British 8th Army arrived. As a result, partisan casualties amounted to 300 killed. In Genoa, 3,100 poorly armed partisans accepted the surrender of 6,000 Germans. In Venice, partisans rounded up 140,293 prisoners for the Allies. On 25 April 1945, partisans kill Benito Mussolini. 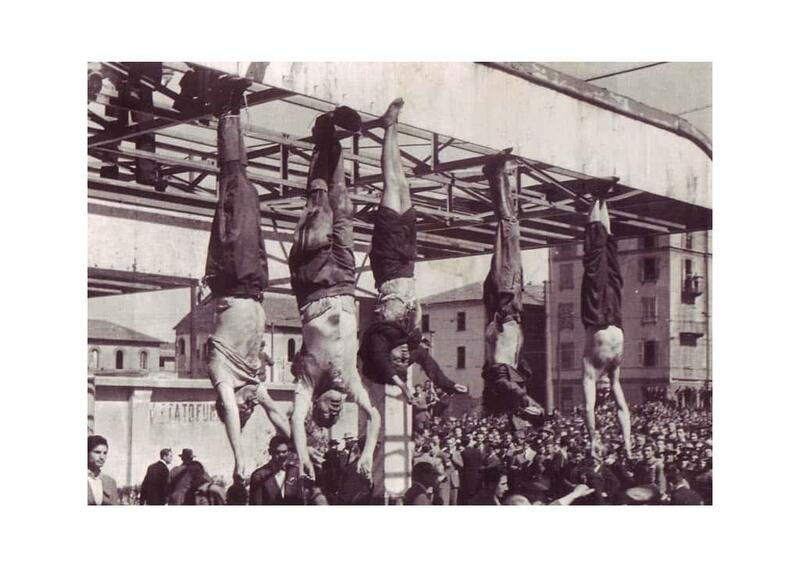 The bodies of Nicola Bombacci, Benito Mussolini, Claretta Petacci, Alessandro Pavolini, and Achille Starace strung up at Piazzale Loreto, Milano on 25 April 1945. Partisan membership grew from some 20,000 in May of 1944 to 200,000 by April of 1945. By April 21, 1945, partisans attacked in an organized sweep and took control of all towns and cities not yet reached by the Allies. However, over 35,000 partisans died by the time Italy became liberated in the spring of 1945. The war ends in Italy on May 2, 1945.